Please read and critique the following short story. Each of them sat facing opposite directions on the edge of the bed in the small, master bedroom of old house on 54th street. For more than 30 years, they had lived here as husband and wife, but it still didn’t feel like a home to her. The cool breeze that blew in from the garden delivered a sweet lilac smell, but provided no relief from the hot summer air that hung between them. They had argued again, and this time she knew it was different. Her words this time were more bitter and harsh than ever before. Now, she would not look at him. She focused only on the picture of Christ on the wall beside her bed, pondering her journey to this time and place. She has spent more then 3 decades of her life with a man she didn’t even like. Why did she do that? They have no children to be concerned about; no connections that couldn’t have easily been broken. It was probably her mother’s influence. Hours of cleaning and cooking turned into overbearing lessons of loyalty, marriage, and the inessentiality of love. Her mother wanted her daughter to be married, and married for a very long time. Mother wanted her to be happy of course, but that was only secondary to the duties of a real wife. Until now, she never really understood the ramifications of her mother’s teachings in her life. Well, she thought, at least my mother got what she wanted. Papa was different. He never lectured her on how she should be. Although she was very plain and not what most men were looking for, Papa never made her feel that way; that is, not until she met her would be husband. This was probably also the reason her father grew to like her husband so quickly. “He is a good provider; he will take care of you and your children,” he pressed her. She knew her father was too kind to say that she should take the chance to marry while she had one. It would probably be her last. He loved his daughter, but he knew reality as well. In the end, it was not about what she wanted. Pressure from her old-fashioned family rendered it unacceptable for her to go to college and travel as she wished to. In the end, she never even brought up the idea. Now, she thinks she should have tried. With these thoughts, a feeling of grief replaced her anger. She mourned for things she could have studied in school; the classes she could have taken; the things she could have learned, for lost memories and experiences she’ll never know, and most of all, for the years she now feels she wasted. She sighs, inhaling the smell of the lilacs from the garden and exhaling their earlier argument, rendering herself numb. Since she does not love this man, then there is no reason to be angry with him either. It was all a waste of time. Dinner time was fast approaching and there was a meal to be made. On the opposite side of the bed he agonizes over the argument that just occurred between them. The cool breeze brushes the scent of lilacs past him, but they are no consolation for the feelings of dismay he harbors. He stares at the picture of her in her wedding gown which hangs on the wall beside his bed. Taken nearly 32 years ago, she gazes down upon him each morning and night to remind him how lucky he was to get her. If she only knew how much I love her, was all he could think. Opinionated, discombobulated, sometimes irrated, overweighted, but never overrated mom of 5 funky, funny, freaks and wife of 1 wonderful, weirdo. 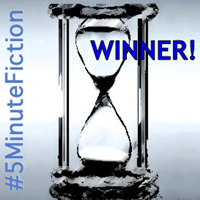 Check out 5 Minute Fiction each Tuesday at 1:30pm EST! Design by Studio ST. Blog Templates created by Web Hosting Men.